This has been the longest sandwich break ever since I started my Sandwich Wednesdays almost 2 years ago – and I missed them badly. 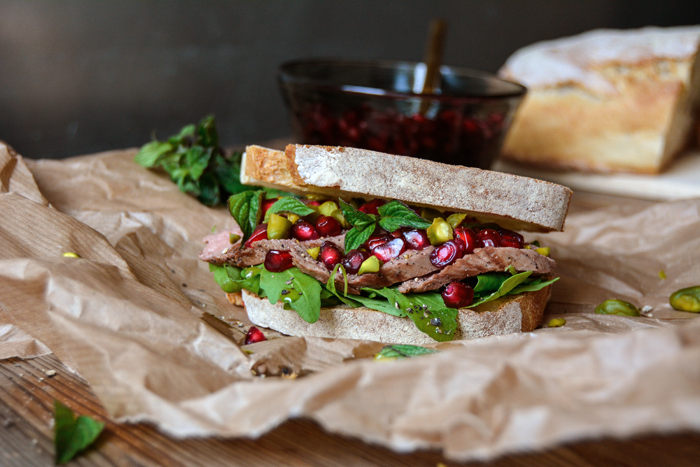 There’s something deeply satisfying about creating a sandwich, taking the pictures of this luscious dish – and especially – eating it! It’s back again and although it was supposed to be a Halloween sandwich I must admit that it didn’t really work out. 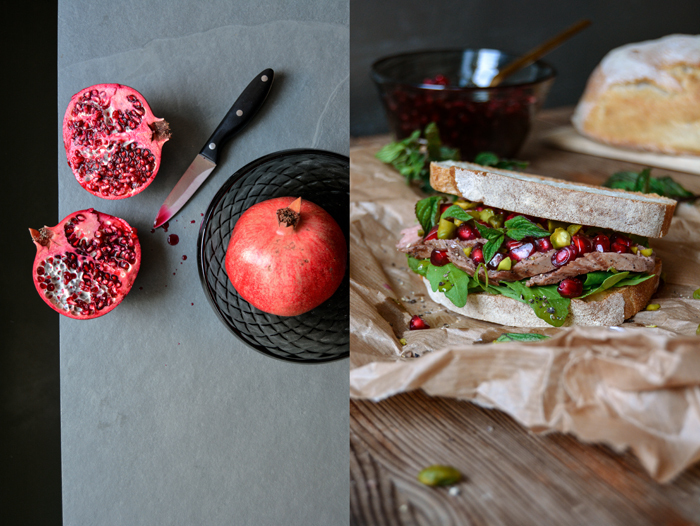 I expected my creation to look a bit messier, wildly dripping with red (pomegranate) juices, but it turned into a pretty sandwich beauty instead. Never mind. 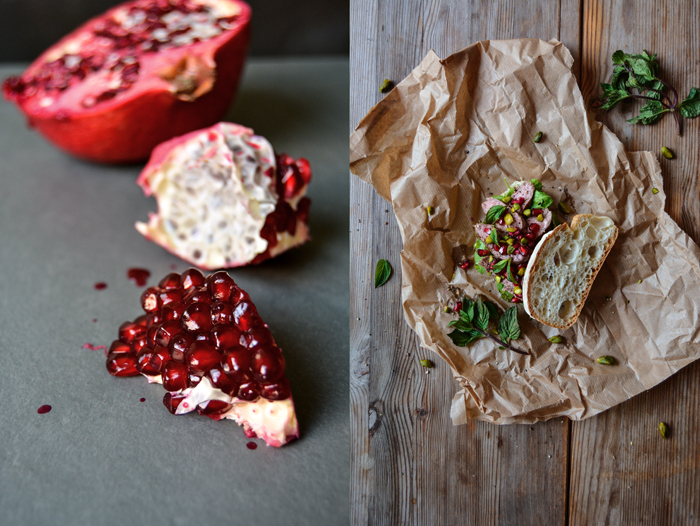 Anyway, the flavours count more than the looks and they are more than promising in this recipe. 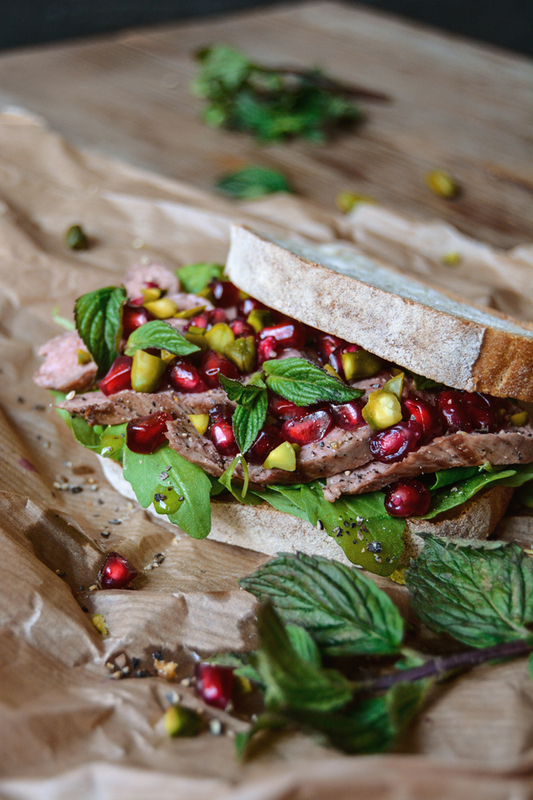 A bit more than a year ago I shared my juicy lamb sandwich with preserved lemons and capers with you, it was a much loved and often featured sandwich that called for a new interpretation. Seared lamb fillet only needs a little salt and pepper to become the most tempting piece of meat you can possibly have on your plate, so there’s no need to change the preparation. But this time the composition went into a different direction. Sour and salty gave way for sweet, sour and nutty. 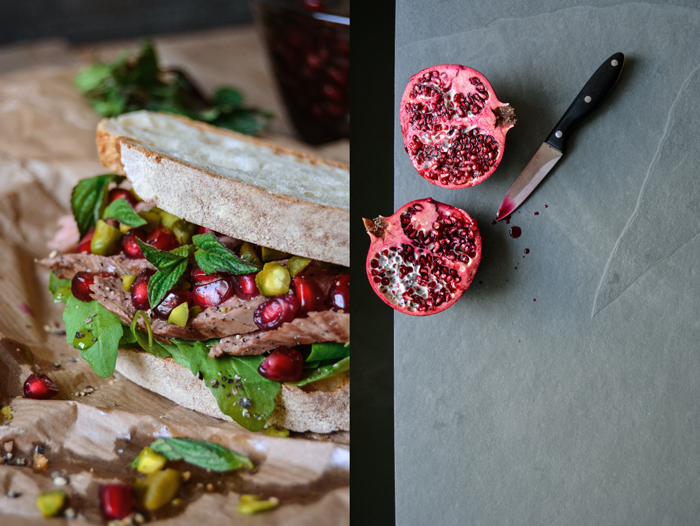 The fine taste of the fillets goes unbelievably well with the tangy, deep red juices of the pomegranate and unsalted pistachios. The topping of mint leaves should be handled with care. The herb can easily be too overpowering and I don’t recommend using the whole leaves as you can see in the pictures but slice them thinly instead. 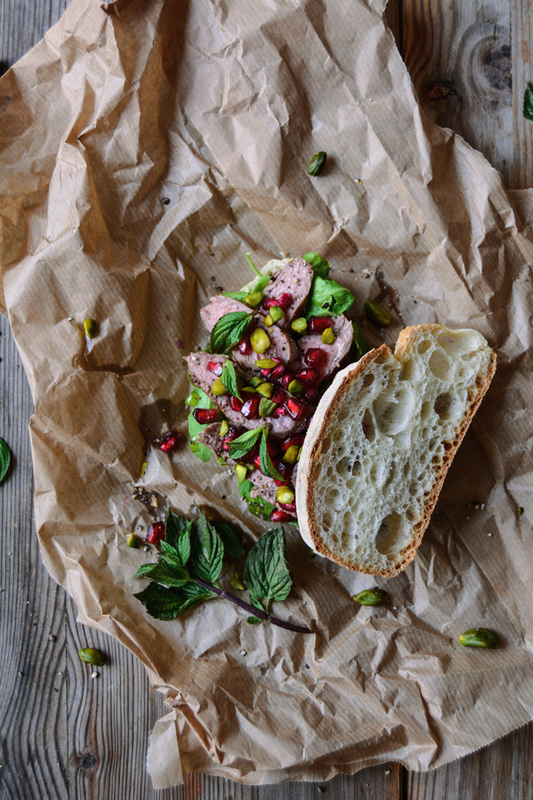 Apart from this rule, you only have to stuff the composition between two slices of thick, juicy ciabatta – or even better, potato bread – and enjoy! A short note: it also works without the bread! 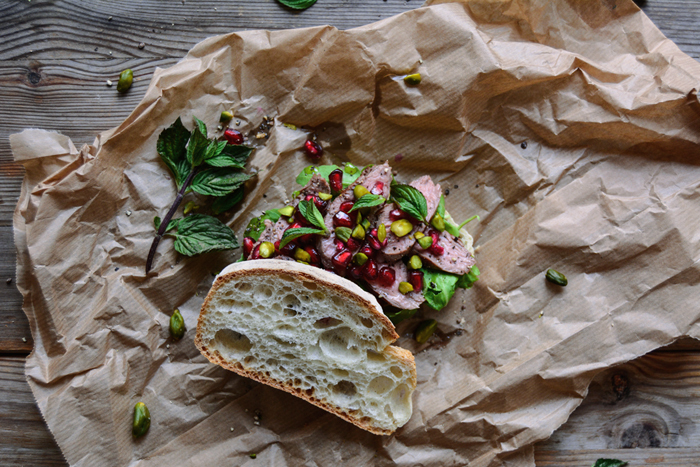 If you don’t feel like a sandwich enjoy the creation without bread, just juicy lamb fillets sprinkled with pomegranate, pistachios and crushed pepper. Heat a splash of olive oil in a heavy pan and sear the lamb for 1 1/2 -2 minutes on each side (not longer! ), the meat should be pink and slightly undone in the middle. Season the fillets lightly with salt and pepper and wrap them in aluminum foil. 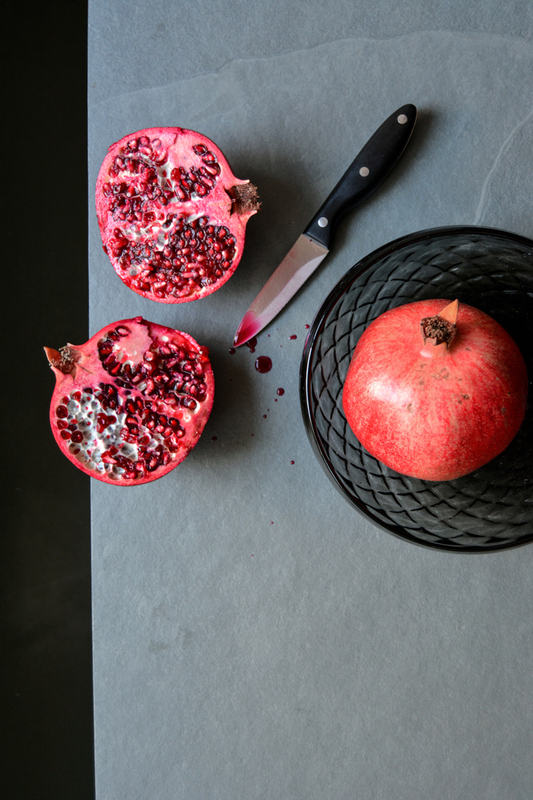 Set them aside for a few minutes before you slice them thinly. Brush the inside of the slices of bread with the juices from the pan and a little olive oil. 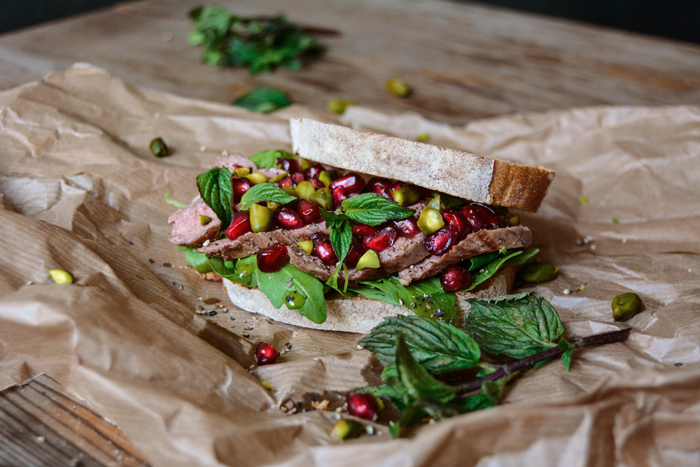 Spread some rocket leaves on each slice of bread, lay a few slices of lamb on top and sprinkle with pomegranate seeds, pistachios, a little mint and crushed pepper. 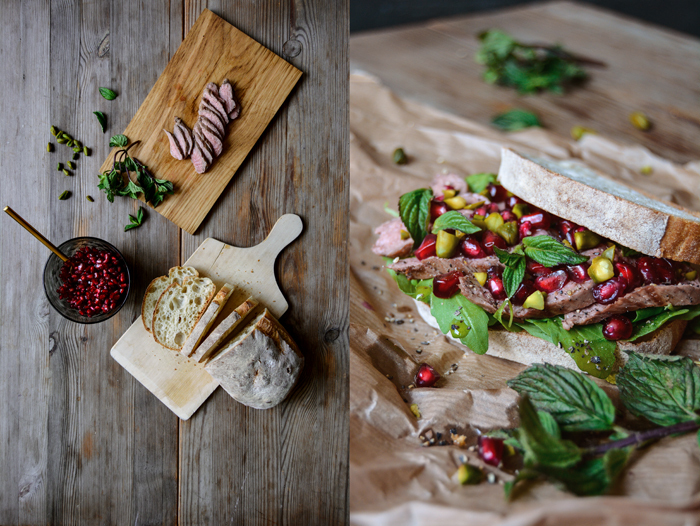 Close the sandwich and enjoy!